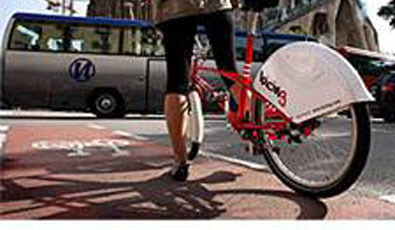 Bicing, the public bicycle scheme of Barcelona celebrates this March its second anniversary. Important changes towards sustainable mobility by bicycle have taken place in a city, where only a couple of years ago, cycling was by most inhabitants not even considered as a mobility option. In average, each day, 35.000 trips are realized by public bicycle in winter, a number which reaches up to 58.000 trips in summer. The public bicycle has reached its maximum extension with 6000 bicycles and 400 stations. Each bicycle is used ten times a day in summer and six times in winter, and in central location the use can be 20 times per day and bicycle. It is calculated that each bicycle realizes 25 kilometres per day. The public bicycle has changed the face of the city, where it now forms part of the urban landscape. Moreover the public bicycle has helped to increase the number of private bicycles. Apart from creating a new sustainable mobility, a new industry has submerged, the industry of the public bicycle, which counts already with more than 200 employees.Regarding the urban mobility pattern, different studies show that the public bicycle is used complimentarily to the public transport, as 30% of the subscribed persons combine the bicycle with the subway, the bus or the tramway.